PCE Instruments: The brandnew datalogger PCE-VDL 16I of German origin measures temperature, air humidity, air pressure, light and acceleration in three axes. The data logging instrument is ideal for monitoring machine vibration and at the same time measuring and recording the mentioned environmental conditions of the machine. For example when used for multi-axis milling machines, the PCE-VDL 16I data logger can provide important information on the development of the vibration / oscillation in chronological order. This information will be helpful to locate and eliminate the source of a problem, ideally before the problem occurs. With its dimensions of just 86.8 x 44.1 x 22.2 mm, the data logging instrument is very compact, which makes it the ideal portable tool for measurement on site. The measurement ranges are 20 … 65 °C for temperature, 0 … 100 % RH for humidity, 10 … 2000 mbar for air pressure, 0.045 … 188,000 lux for light and ±16 g for 3-axes acceleration. The datalogger can be configured in line with your requirements and preferences by means of the evaluation software which comes with the meter as standard and is also available for download on PCE Instruments’ website. Depending on the measurement / recording rate set by the user, the PCE-VDL 16I can measure / record for several days or even months. The acquired data are stored to the tester’s 2 GB SD card and can be transferred to a computer for data readout and further evaluation. Much more information will soon be available on PCE Instruments’ website. 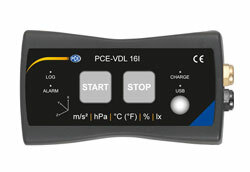 The PCE-VDL 16I data logger can be pre-ordered from the company’s sales offices in the UK, the US, Germany, Spain, Italy, France, the Netherlands, Poland, Chile, China, Hong Kong and Turkey.